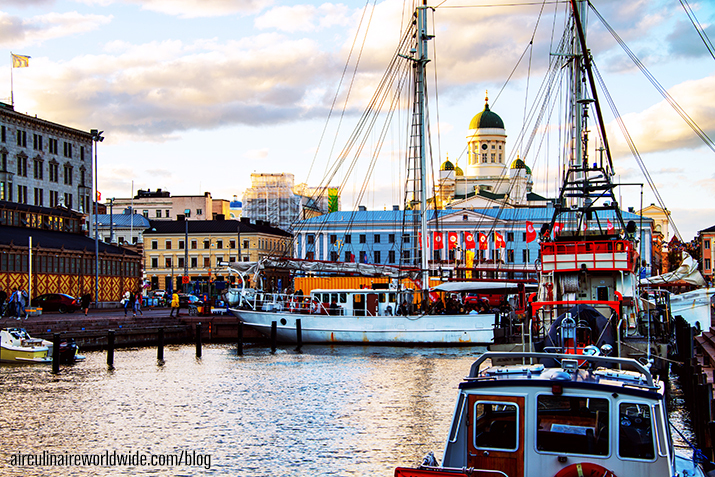 Routinely ranked as one of the most livable cities in the world, Helsinki is the capital and largest city in Finland. Helsinki, which has the distinct recognition of being the northernmost metropolitan area in the world, is home to a combined 1.5 million residents when considering the surrounding Greater Helsinki area. High season for visiting Helsinki starts in May and lasts through September, with July being the peak. When working on a private aviation trip to Helsinki, you will land at Helsinki Airport (EFHK). During preparations for your trip, if crew or passengers require scheduled private transportation during your time in Helsinki, arrangements are available through Universal Private Transport. For inflight dining options on your departure from Helsinki, your needs can be fulfilled through the Air Culinaire Worldwide® Network. As always it is best to plan your inflight catering needs at least 48 hours ahead for the details of your next leg, especially during peak season. This is especially true if you are operating from Finland in July, when locals typically take their summer vacations and some businesses can be closed. Events happen year-round in Helsinki, with summer being the focus for visitors and the bulk of the events take place during those warmer months, but there are many events to keep travelers busy while in Helsinki. Juhannusvalkeat, the Finnish Midsummer Festival, is observed all throughout the country with festivities including bonfires and dancing. In the month of August, you will find the city is alive with the Flow Festival, featuring cuisine, arts and music; Helsinki Festival, the largest in Finland; and Night of the Arts, which offers free admission to many cultural sites like museums and art galleries. September brings the Helsinki Design Week which is the largest event of its kind throughout all Nordic countries. Fall events are the Helsinki Baltic Herring Market, established in 1743, this event is centered on local food culture; Baltic Circle, a festival for contemporary theatre; Slush Helsinki, an event focused on fostering start-up businesses. When visiting any location for the first time, it is good practice to research the local cuisine. Some local and cultural favorite food items in Helsinki include Pea Soup with pork and mustard, also called “Thursday Soup;” Baltic Herring, fish is a staple of local cuisine and especially this local breed of herring, you can find it served many ways including pickled; Cabbage Rolls, steamed and served with beef, onions and spices; Blinis, small pancakes that can be paired with sweet or savory toppings and fillings; Lingonberry Pie, mostly abundant during summer; Runeberg Torte, an iced rum cake which is only available at the beginning of each year; Pulla, a local type of cinnamon bun. If you have any questions about inflight catering for private jets in Helsinki, Finland; contact weborders@airculinaire.com.